Chelsea’s troubled season took another turn for the worse as they suffered a potentially costly defeat in the battle for a top-four finish. They dominated the first half at Goodison Park but went behind to Richarlison’s goal early in the second – and Gylfi Sigurdsson scored with 19 minutes remaining to seal Everton’s win. It left Chelsea in sixth place and potentially needing to win the Europa League in order to secure a place in next season’s Champions League. They should have been ahead after a one-sided first half in which Eden Hazard curled an effort onto the post and Gonzalo Higuain also went close for the visitors. However, it was a totally different story after the interval and a defensive lapse by Chelsea helped Everton take the lead. 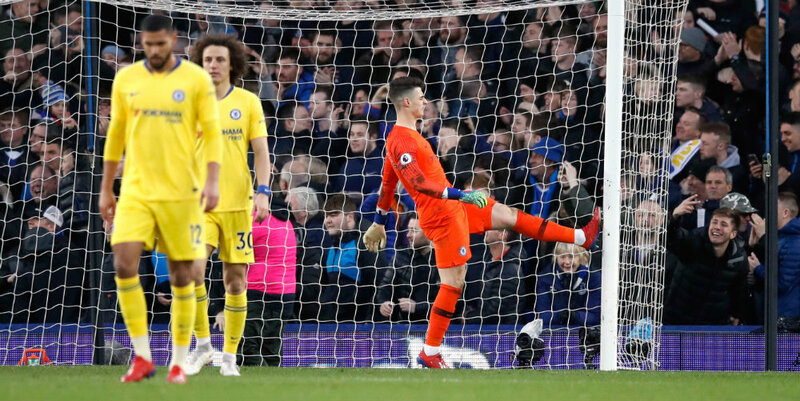 After keeper Kepa Arrizabalaga parried a header from Dominic Calvert-Lewin, who easily got in front of David Luiz to meet Sigurdsson’s right-wing corner, Richarlison was on hand to nod home the loose ball. Worse followed for Chelsea when a penalty was awarded after Marcos Alonso was adjudged to have fouled Richarlison. Kepa saved Sigurdsson’s spot-kick but the Icelander followed up to score. Chelsea: Arrizabalaga, Azpilicueta, Rudiger, Luiz, Alonso, Jorginho (Hudson-Odoi 74), Kante, Barkley (Loftus-Cheek 65), Pedro, Higuain (Giroud 65), Hazard. Chelsea leadership to blame for taking too long to decide on Sarri. That manager is the worst the club ever had.